Kam - Excellent set made the right choice buying these and replacing the standard BMW M sport springs, given my car an awesome stance and looks great. Highly recommended don't wait buy now! It's our legendary spring system that dramatically improves both a vehicle's performance and appearance. Pro-Kit lowers your car?s centre of gravity, reducing squat during acceleration, body roll in corners and excessive nosedive under braking. All spring lowering amounts are measured off the Standard chassis, this would not include models such as sports, Sline and Msports for example which may come lower from factory, you will need to take that measurement off of our measurement to give you an approximate drop. Kam Excellent set made the right choice buying these and replacing the standard BMW M sport springs, given my car an awesome stance and looks great. Highly recommended don't wait buy now! Anonymous Exactly what I wanted. Superb help, and even better product. Just had the springs fitted and they make the car look incredible. I went for the 35mm kit. If you are after a comfortable ride but with a killer look I would highly recommend this pro kit. No compromise on ride but the look and handling are 10 times better. Nigel Simms Bought a coil spring from this company. Extremely helpful in sourcing the right part.Pleasant people to deal with.Would cerainy recommend this company. Nigel. Sent. Dan Great product, really easy to find on the website and really fast delivery. A* service. 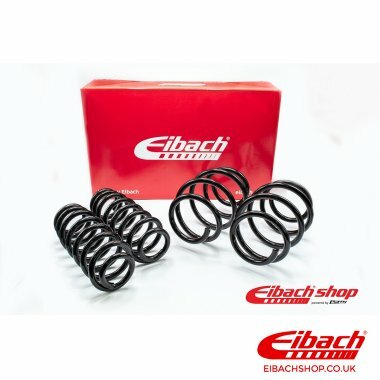 Chris Great service, fast delivery, products seem good quality.... only downer.... no Eibach stickers! Martin Great service and fast response to email, car looks great and handles fantastic. Andrei Perfect compromise between looks, confort & handling! Quick dispatch and good service overall.